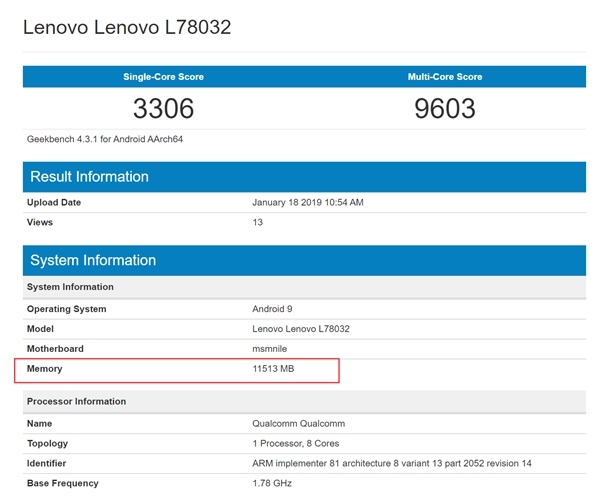 The Lenovo Z5 Pro GT has recently been spotted in benchmarking site, Geekbench, revealing its monstrous specs, including a hefty amount of RAM, well, it’s basically the world’s first with 12GB of LPDDR4X RAM. Despite running on a Snapdragon 855, it scored noticeably lower than other devices with the same chipset, both for single and multi-core benchmarks. The Lenovo Z5 Pro GT has a 6.39-inch Samsung AMOLED display and boasts a 24MP + 16MP dual rear camera system with AI features. It packs a 3,350mAh battery and is priced at $398 for the 6GB + 128GB model, and $442, $501, and $649 for the 8GB + 128GB, 8GB + 256GB and 12GB + 512GB variants respectively.